Imparsial, the Indonesian Human Rights Monitor, has expressed its deep regret at the action by the police who shot Mako Tabuni, the chairman of KNPB, the National Committee of West Papua, resulting in his death. ‘It is extremely regrettable that the police shot Mako Tabuni, as a result of which this activist died,’ she said. She went on to say that the police would have needed evidence in order the conduct an investigation. and if they did have such evidence in this case, Mako Tabuni should have been taken into custody and treated as a suspect. ‘The procedure would then be for the police to summon the person in question for interrogation. He can only be detained if there is reason to fear that he may abscond or commit a further crime. A person can indeed be arrested if he is caught red-handed. But bearing in mind that this was not the case, the action by the police in arresting and shooting Mako Tabuni was a violation of the criminal procedural code, KUHAP. The failings of the police can only result in the situation getting worse, reinforcing the occurrence of further acts of violence and causing the people to feel even more insecure. The concern raised by the chairwoman of the ‘imparsial’ relates to ongoing gross human rights abuses and in particular regarding the slain of Mako M Tabuni is well appreciated. The recent arrest of Chairman of KNPB Buchtar Tabuni and current murder of the KNPB’s Vice-Chair I – Mako M Tabuni is clear indication that the colonial authorities are detrmined to kill and suppress the leaders of the group (KNPB) based on notion that when the leaders are killed or reprimanded in jails the movement (peaceful struggle to demand referendum) will die away. They (the colonial authorities) are wrong in having formed such notion. when leader/s killed, more leaders will raise up. So instead of fading the movement will grow from strength to strength. Ccolonial authorities should realise and read the changed time now that it is time for them to turn to the dialogue with the Papuans. 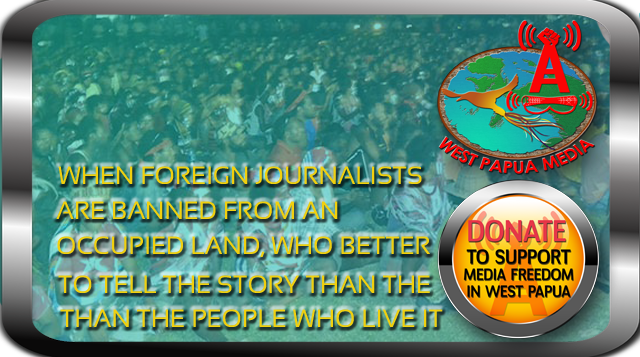 They should leave behind the ‘living sayings’ of their forefathers and fathers that ‘they annexed West Papuan with the blood so to leave West papua to choose its own destiny there has to be blood bath in papua’. How much more blood papuans have to bled? How much more lives papuans have to lose?. Or are papuans not humans? are papuans animals? is the land of Papua a chamber of slaughtering and buthchering?. Are there people with eyes, ears and heart out thre in regional and international governments and nations? Are the governments constituted of animals with no human hearts and brains? Papuans urgently need inetervention of the united Nations peace keepers.